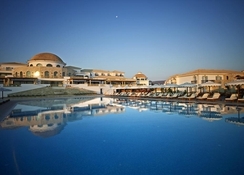 The Mitsis Laguna Resort & Spa in Anissaras, Crete, is the ideal holiday destination if you want to enjoy delicious food and a luxury hotel experience. The 5-star beachfront hotel has no less than three outdoor pools and one indoor pool, plus the sandy Anissaras beach just steps from your room - meaning there’s plenty of space for guests to pick their lounge spot. In addition, the hotel has a host of sports activities on offer, including water polo, tennis courts, an on-site gym, nearby watersports and much more. The hotel spa is one of the main features here, with beauty and wellness treatments to indulge in for ultimate R&R. The rooms and suites at Mitsis Laguna Resort & Spa offer comfort in a variety of shapes and sizes, with plenty of choices for guests. The hotel is located on the beachfront, so guests can easily access it when they choose. Shops, restaurants and a varied nightlife is a short 3km away in the town centre in Hersonissos. The hotel is also just a 5-minute drive from Crete Golf Club, so if guests fancy a change of scenery then that makes a fun excursion. To add to this list of local attractions, the Aquaworld Aquarium and Sarandaris Beach are just 3 miles away – an ideal day out for kids. Accommodation in this hotel includes a variety of comfortable rooms including: Family Room, Sea View Twin Room and the Twin Room. All rooms come with TV’s, a bathroom, shower, hairdryer, a balcony or terrace, satellite channels and extra seating room. The modern clean-looking designs add to this hotel’s luxury feel and experience that guests get. The rooms also have air conditioning, Wi-Fi access and tea and coffee making equipment. In the Mitsis Hotel there are four bars to enjoy. The Night Bar sells spirits, cocktails and hot drinks from 18:00-01:00, The Champagne Bar (adults only with dress code) is open from 18:00-01:00, The Laguna Pool Bar is open from 10:30-00:00 and The Theatre Pool Bar which is open during the shows at 10:30-18:00 and 20:30-23:00. There are also 7 excellent restaurants that guests can dine in - the main restaurant offering breakfast from 05:00-10:30, lunch from 12:30-14:30 and dinner from 19:00 to 21:30, The Cretan Tavern for lunch and dinner, an Asian Restaurant and Mexican restaurant also open for dinner, a Sushi Restaurant and an Italian Restaurant open for lunch and dinner, and finally a Creperie & Gelateria which is open from 10:30 to 02:00. 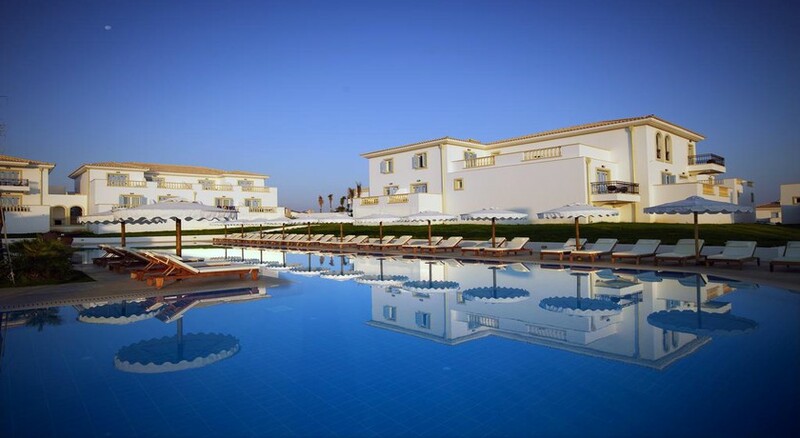 The swimming pools are the main sources of entertainment at this hotel, however there are many sports activities available including beach volleyball, tennis, football, canoeing and pool games. There is also a choice of motorised watersports for a charge, as these are run by the locals. For kids there are specific slides and play areas, while the in-house spa is the place to relax after a long day. In addition, there is live music and entertainment in the evenings. Cards accepted: Mastercard, Maestro, Visa, American express and Visa Debit. Babysitting and child services are available (for additional charge). Distance to Chania Airport: 2 hours, 40-minute drive. Hubby booked this fantastic hotel for my 70th birthday . What a truly beautiful surprise. Excellent hotel, staff, surroundings, etc. Five themed restaurants plus creperie, adult only champagne bar, night bar and normal bar. My only complaints were that as usual in Greek hotels food in main restaurant was lukewarm but I am not a big fan of self serving so we ate main meals in the themed restaurants most nights. Also the entertainment was not good. A greek night, a magician and a trio singing whereas at other Mitsis hotels they have tribute nights which are great and as in the Laguna you cannot get out to bars and restaurants outside easily think would find this a bit much for two weeks .A bit remote but a cab to Hersinossos about 8-10\aq euros depending on the driver! All in all a wonderful week break and would have liked to stay longer other than for the entertainment issue. Facilities are excellent, restaurants fantastic, staff are friendly and very accommodating. I wouldn’t usually consider going back to the same place on holiday but I would definitely return here. Good: Crete is a sightseer's paradise with an extraordinary range of art and architecture, historic and prehistoric . . . Thanks to its rugged mountains and a rugged friendliness among the local population western Crete is unforgettable. Bad: Because of Crete's early development as a package-holiday destination, many of its resorts grew up in an uncontrolled sprawl of concrete,making much of the north coast outside and between Crete's cities a continuous suburban ribbon. Good: Crete is a great deal more than just another Greek island . . . when you lose yourself among the mountains and the less-known coastal reaches of the south it has everything you could want of a Greek island and more: great beaches, remote hinterlands and hospitable people. Every part of Crete has its loyal devotees and it's hard to pick out the highlights, but generally if you want to get away from it all you should head west. Bad: The north east in particular is overdeveloped, and though there are parts of the south and west coasts that have not been spoiled, they are getting harder to find. Good: Greek's largest island and in a hundred ways its most extraordinary. Endowed by a generous nature with every earthly delight . . . Crete's crushing popularity is a tribute to its extraordinary charms . Of all the islands, Crete has the sharpest sense of a separate identity and the most ferocious love of liberty. Bad: The lovely beaches along the north coast have been raped by toadstool strips of jerry-built hotels, shops, restaurants and discos, tourist compounds often run by Athenians or foreigners where bars advertise daily video showings of The Beverly Hillbillies, the latest football scores, baked beans and permanent happy hours . . . Each year it becomes more difficult to visit even remote corners . . . without a dozen coach loads of tourists and rubber-tonsilled guides on your back.